West Worcestershire MP Harriett Baldwin gathered a handful of political hopefuls to celebrate International Women’s Day last Friday. The MP invited local female candidates to join her in Malvern to mark the day and to encourage more women to stand for public office. Harriett was joined by current councillors Hannah Campbell, Pam Cummings and Andrea Morgan together with Karen Hanks, who is planning to stand in the up-coming district council elections. The MP has worked hard both locally and nationally to encourage women of all ages to stand for public office aiming for equal representation. Harriett commented: “There are still too few women standing for public office and this means that women’s voices and views have for too long been overlooked. “I work continuously to encourage more women to get elected either at a local level or nationally in Westminster and I am pleased to see more female candidates than ever before standing at the coming district elections in Malvern Hills. 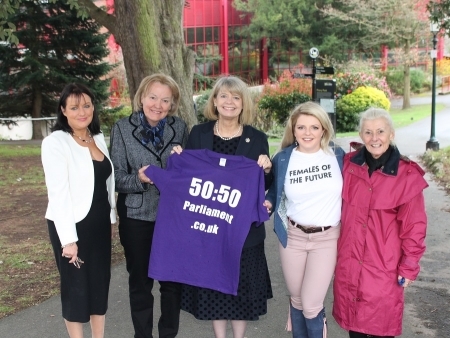 Photo: (l-r) Karen Hanks, Cllr Pam Cummings, Harriett Baldwin MP, Cllr Hannah Campbell and Cllr Andrea Morgan.